The Two Stroke vs Four Stroke dirt bike debate has been raging for decades, and it seems everyone has an opinion. Trying to convince a two-stroke lover of the benefits of a four-stroke, or visa versa is an exercise in futility. Can you say definitively one is better than the other? So in this post, I’ll investigate the pros and cons of each, and without getting too technical, help you make an informed decision on what is best for YOU. Back in the day, the late fifties and sixties, when motocross was in its infancy, called scrambles back then, a big four-stroke was the only choice you had. They were stripped back versions of road bikes like BSA, Triumph, AJS and CCM. Suzuki and other Japanese brands changed all that from the late sixties, with riders like Roger DeCoster on the Suzuki RH factory bikes spelling the death knell for four strokes. The two-strokes dominated right up until 1995, when Joel Smets won the world title on a four-stroke Husaberg, marking the beginning of a new era. 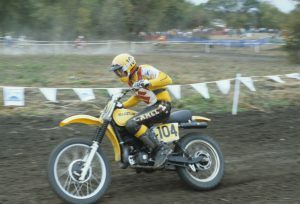 Yamaha followed on in 1997 with an AMA Supercross win on a YZ400M. The following year the bike became available to the public and other Japanese manufacturers followed suit. 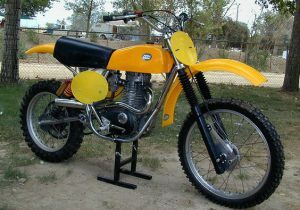 The four-stroke has dominated the MX scene since then. But the enduro and off-road scene is a different story. 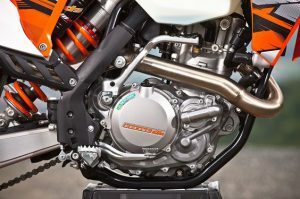 Both engine types have enjoyed success due largely to KTMs persistence to develop both. If you’re in the market for a dirt bike, you have a great selection to choose from. 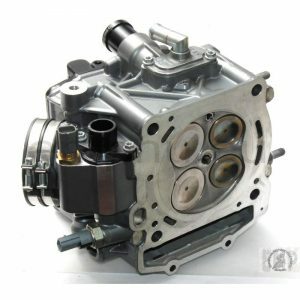 The European manufacturers like KTM, Husqvarna, Gas Gas, Beta, and Sherco all produce a wide selection of capacities. 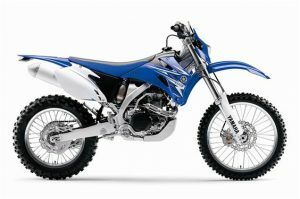 Add to that the Japanese manufacturers like Yamaha’s WRFs and Honda CFRXs and the choices are great for the dirt bike buyer. 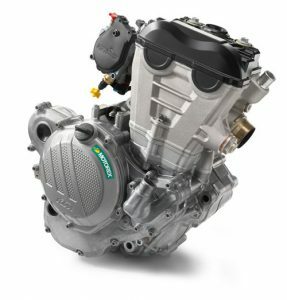 Basically, the two-stroke engine has three primary moving parts, the piston, connecting rod and the crankshaft. There are no valves in the head like in a four-stroke engine, just ports in the cylinder. There are two main stages, hence the name ‘two-stroke’, the Compression Stroke, and the Combustion Stroke. A two-stroke fires on every revolution of the crankshaft. This is what gives the two-stroke it’s explosive power delivery. The compression stroke is the upward movement of the piston which draws in a mixture of petrol air and oil. This is ignited by the spark plug and forces the piston downward in the combustion stroke. The engine is lubricated by oil mixed with the petrol, which is why they emit more smoke than a four-stroke and has lead to the environmental issues against the two-stroke. Manufacturers are now producing cleaner-burning engines in response to this. The two-stroke engine is higher revving than the four-stroke and produces most of its power in the upper rev range. So while the engine is simpler, the need for maintenance is higher due to the higher revs and higher wear. The good news is that two-stroke parts are generally cheaper than four-stroke parts. One disadvantage of the two-stroke is the large expansion chamber, which is very vulnerable to damage. Thankfully there is a wide range of protector shields available. The four-stroke engine is more complex than the two-stroke. There are four main stages (or strokes, hence the name ‘four-stroke’), intake, compression, combustion, and exhaust. A four-stroke engine fires every two revolutions of the crankshaft, giving it a steadier and more predictable power band. The extra weight of a four-stroke is due to the additional moving parts in the head, like valves, camshafts, rockers, cam chains. Modern four-strokes are usually double overhead cam with 4 valve heads, 2 inlet valves, 2 exhaust. Older British four-strokes were usually pushrod operation. The engine is lubricated by oil in the crankcase, so the engine is cleaner burning as there is no oil mixed with the petrol. The four-stroke engine produces more power in the lower rev range. This more tractable power makes them easier on the rider and very well suited to the beginner. 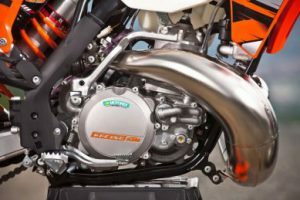 The difference between the two engine types means that generally, a two-stroke’s power equates to a higher capacity four-stroke for equivalent power. So a two-stroke 125cc is very similar in horsepower to a four-stroke 250cc. The beginner will find the four-stroke power easier to handle on the trails. The two stroke’s burst of power and extra gear shifting and braking requires a lot more technique. On the other hand, a two-stroke forces you to learn the basics of riding like throttle control, selecting the right gear, cornering and braking, all on a lighter bike. You could learn on a two-stroke and then later upgrade to a heavier four-stroke bike. If you compare the two-stroke and four-stroke of equal capacities, the two-stroke will always come out on top due to the fact it fires twice the amount of times! Both engine types have come a long way in recent years. Gone are the days when a big two-stroke had nothing down low, then would yank your arms out of your sockets when the power band kicked in. Modern two strokes are far more sophisticated due to the advent of power valves, and able to deliver power through a broader rev range. The modern thumpers have come a long way too. From low revs to redline the four-stroke produces a steady linear powerband that is predictable and gets the power to the ground. While two-stroke riders are constantly going through the gears, the four strokers will pull from almost any gear. In a straight out drag race, the two-stroke will win, but off-road riding is not a drag race. While the initial expectation is that the four strokes are heavier, it’s not quite as simple as that. 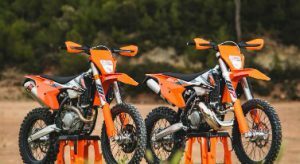 There is only 3kg difference between the KTM 250EXC and the 250EXC-F. It’s where the weight sits that affects the feel of the bike. A four-stroke is a taller engine, which raises the center of gravity of the bike, making it feel heavier than the 3 kg would suggest. Assuming you’ve got your bike’s suspension dialed in for your weight, and taking into account the taller engine of the four-stroke, the lighter bike is always the winner. When you look at the regular expenses in running each bike, it’s pretty well even. The consumables for a two-stroke are the two-stroke oil mixed with the petrol, and for the thumper, it’s the engine oil and oil filters. For the rest of the bike, your usage of tires, brakes, chains, and sprockets is dependant on where you ride and how hard you ride, no matter which bike you choose. The thumpers win hands down on this. No measuring out and premixing oil (although some manufacturers are reintroducing oil injection) or remembering to carry your two stroke oil with you. The thumper is easier to ride and smoother on long road stretches if you are riding to your trails, and more fuel efficient, which is great if you are isolated and miles from the nearest gas station. If you are reasonably mechanically minded and do most of the maintenance on the bike yourself, the thought of removing a two-stroke head and cylinder is not too daunting. You will be right if you follow the manual. Two stroke parts are fairly cheap. But the thought of a top end rebuild on a four-stroke is probably enough to make most riders want to take it to the shop, which means labor costs. 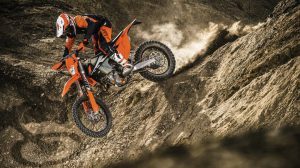 Assuming you are not a racer, and just using the bike for weekend trail riding, if you keep on top of the oil changes yourself, and check the valve clearances occasionally you will be right. They both do what they do extremely well. It’s like comparing apples to oranges. 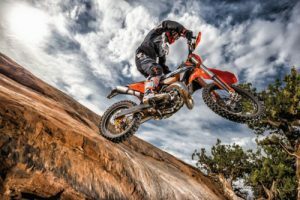 Where the two-stroke wins out in terms of lightweight bike and handling agility, the four-stroke wins out with less rider fatigue and easier ride. 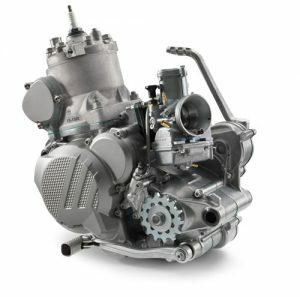 Where the two-stroke wins out in outright power for engine capacity, the four-stroke wins out in the usable delivery of that power through the entire rev range. Where the two-stroke wins out with cheaper engine rebuilds, the four-stroke wins out with less frequent maintenance periods. Your off-road riding experience and ability to handle the bike’s weight. Your budget when it comes to repairs. Are you able to DIY a lot of the work? The type of riding you’re doing, and the terrain you ride. If you want to go blasting through the sand dunes or desert, a 450 four stroke is ideal. That’s what they ride in the Dakar Rally. 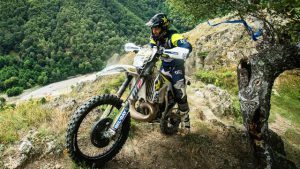 If tight technical single trails are your thing, and you like to throw a bike around like a BMX bike, a 250cc two-stroke would be the ideal choice. Put simply, it comes down to WHERE you ride, and HOW you ride. What is right for YOU. What is your opinion? Have you owned both a stroker and a thumper? Which do you prefer? Let us know your thoughts below. This is awesome I’ve been looking into buying a dirt bike and I didn’t know which to get between 4 stroke or 2 stroke. this website has helped me learn about both and I think I will be going with a 4 stroke. I want a dirt bike just to have some fun and I think the 4 stroke will do the job. thank you very much on the information I will be back to read up on some more. can you tell me where or what make would be best to purchase a dirt bike? Hi Tommy, thanks for your comments. I agree with you, a four-stroke would be good to start on, easier to ride. I would recommend not going bigger than 250cc for a first bike. If you read my post Tips For A Beginner Dirt Bike Rider you will find a lot of useful information there. I recommend the Yamaha TTR 250 as an ideal bike. You’ll see a picture of one there. There are lots of useful posts for a new rider. The Suzuki DRZ 250 would also be a good choice. You may also find help with my post Dirt Bike Riding Tips and Techniques on the riding side of things. Please let me know if there is anything else I can help with.